D CEO Magazine is a monthly business publication, published by D Magazine. 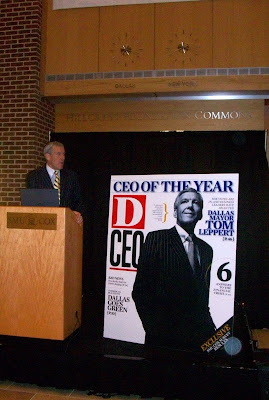 Tonight they held their annual CEO of the Year awards in conjunction with the SMU Cox School of Business. It was a lovely soiree at the SMU Collins Center where approximately 200 Dallas executive's toasted the CEO of the Year - Mayor Tom Leppert. The Mayor just announced his bid for re-election, so I'm sure the accolade is timely for his political ambitions. I've met him briefly on several occasions and he seems like a swell guy. If Dallas' leading business executives voted him their pick for CEO of the Year - he must be doing something right! Aston Martin had a couple of cars out front of the building and the valet guys were having to fight the frat boys off the vehicles. I've never seen men drool like that, except over naked women. Just looked like a car to me. Now James Bond in that car... Now, I'm drooling! About this blog: What is Oh So Cynthia? It’s a Mom Blog about life in Dallas. You can call me a Mommy Blogger, but I prefer Social Media Mommy. Posts on this blog reflect the experiences of my life in Dallas and Park Cities, product reviews and my thoughts on parenting boy in this hi-tech, fast-paced world.